Fibromyalgia, or FM, has a long and mysterious presence in medical history. In the past, it’s been known as fibrositis, fibromyositis, and simply “stiff-man syndrome” when it was first discovered in 1946. This controversial condition has become even further misunderstood due to this history of misnomers - “itis” actually signifies inflammation. Despite the pain of FMS, inflammation has been proven not to be part of the pathophysiology; at least, not the arthritis or myositis type of inflammation that was previously thought to progress the illness. In 1981, it was identified that Primary FM patients are usually females aged 25-40, but it can occur in men and children as well1,2. Patients complain of diffuse musculoskeletal aches, pains or stiffness associated with tiredness, anxiety, poor sleep, headaches, irritable bowel syndrome, frequent urination, and subjective swelling in and around the bones that causes numbness. Physical examination is characterized by presence of multiple tender points at specific sites and absence of joint swelling. Symptoms are influenced by weather and activities, as well as by time of day (worse in the morning and the evening). Patients tend to become frustrated due to lack of satisfactory answers and treatment results. A combination of reassurance, nonsteroidal anti-inflammatory drugs, good sleep, local tender point injections, and various modes of physical therapy is successful in most cases, they wrote1. Drug therapy alone is seldom effective in alleviating symptoms – a carefully planned education program is necessary to readjust both mind and body3. In 1990, the American College of Rheumatology outlined a set of diagnostic criteria for the classification Fibromyalgia Syndrome4, including a history of widespread pain. Pain in either the neck, chest, mid-back or lower back was mandatory for diagnosis. In addition, pain in 11 of 18 specific tender sites (where the muscles insert into bones) upon physical assessment by the doctor, including the skull, neck, shoulder, rib, buttocks and knee, was also mandatory. For a tender point to be considered positive, the physician must apply 4kg of pressure and the subject must state that the palpation was “painful”. “Tender” is not considered truly painful. Yet, in spite of this classification, there is still no “gold standard” for the diagnosis of FMS. And what’s more, criteria for diagnosis may be changing5,6. Despite the limited diagnostic criteria set forth by the American College of Rheumatology, many FM sufferers express additional symptoms, including facial pain and headaches with stiffness or tenderness in the shoulders or neck, known as TMJ. The relationship between some medicines and FM have been highlighted in the research: statins for cholesterol lowering7, post Hepatitis B8 and HPVvaccinations9. In addition to a plethora of clinical and environmental precursors that have been linked with the development or prevalence of FM, nutrient deficiencies have also been isolated as a key problem. Zinc10: Low levels of Zinc associated with FM. More tender spots associated with zinc deficiency. Vitamin D11,12: Symptomatic myalgia in statin-treated patients with concurrent Vitamin D deficiency may reflect a reversible interaction between Vitamin D deficiency and statins on skeletal muscle11. Non-specific muscle pains among Arab and Indian-Pakistani populations may indicate Vitamin D deficiency, and prompt treatment can result in resolution of symptoms12. CoQ1013,14,15,16: CoQ10 controls inflammasome that are involved in inflammation pathogenesis of FM pathogenesis13. Administration of CoQ1014 alone and in combination with L-Carnitine15 improves hyperalgesia and quality of life in patients with fibromyalgia, which may be explained via its ability to ameliorate oxidative stress and protect mitochondria14. An important clinical improvement was evident after CoQ10 versus placebo treatment, showing a most prominent reduction in pain, fatigue, and morning tiredness. Furthermore, researchers observed an important reduction in the pain visual scale and a reduction in tender points, including recovery of inflammation, antioxidant enzymes, mitochondrial biogenesis, and AMPK gene expression levels. These results lead to the hypothesis that CoQ10 have a potential therapeutic effect in FM, and indicate new potential molecular targets for the therapy of this disease16. The main function of the cell is to produce energy. Inside each cell is a complicated nutrition-dependent system that is responsible for producing energy for every cell in the body, whether they’re nerve cells, brain cells, heart cells, white blood cells, bone cells or muscle cells. The same nutrients are involved in the energy generation of all cells, but some cells are more metabolically active than others. This means that if there is not sufficient nutrition for the cell to produce energy, then all the organ systems of the body can suffer. This appears to be the case in FM. Some FM patients know they were never well since an accident or illness, while others may have caught a virus, such as Epstein Barr, and never recovered. Compounded with a poor diet, food sensitivities and drug-nutrient depletions FM can take on a life of its own, with neither patient, nor physician, knowing what helps and what doesn’t. If you do not have FM, then it is still important to protect the proper energy and detoxification processes of the mitrochondria. There are many other nutrients involved in the production of energy in the body. Because FM is a condition where energy is lacking, it makes sense to assess deficiencies or additional requirements for the following nutrients as well. In the Krebs cycle, we need blood sugar, yes, as sugar is the main brain fuel. The brain prefers a consistent but low level of sugar for optimal function. Complex carbohydrates, including fiber and accompanied by fatty acids (Omega 3 and 9), and proteins provide the best food fuel for the brain in order to minimize blood sugar spikes, encourage focus, and also give the brain the other nutrients needed to produce energy. Other nutrients involved in this process are the B vitamins, a group of water-soluble vitamins required to make enzymes essential for cell function and detoxification. 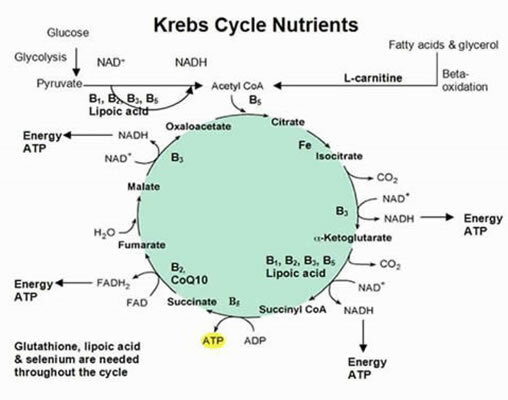 All B complex vitamins act as coenzymes, or cofactors in the synthesis of key enzymes involved in the Kreb Cycle. Vitamins B6, B12 and Folic acid play a special role in reducing free-radical damage, helping to increase the number of mitochondria and activity as well as support cellular detoxification. One study found that supplementation with Folic Acid and vitamin B12 may be effective to reduce the arsenic-induced damage at molecular target level and effectively increase urinary clearance of arsenic18, a heavy metal currently in toxic levels in some of our food supply. There are still a lot of unknown factors when it comes to FM, which is one reason why the diagnostic criteria continue to change. However, we do know a few things. Clinical research has determined that FM is not a condition of inflammation, like arthritis, even though there is pain, fatigue, and possibly some inflammation from cytokynes and chemokines20. In the past, we have looked at the musculoskeletal system, nervous system, endocrine, mental outlook and more in order to understand the variety of symptoms that encompass this disease. As mitochondrial disease continues to become better understood, what is becoming clear to some researchers and physicians is that the accumulation of etiological factors and organ systems can be condensed to the common denominator of the mitochondria. These power plants of energy, found in every body system and every cell type, with the exception of the red blood cells, are a likely hinge on which FM manifests. Yunus M, Masi AT, Calabro JJ, Miller KA, Feigenbaum SL. Primary Fibromyalgia (fibrositis): clinical study of 50 patients with matched normal controls.Semin Arthritis Rheum.1981 Aug;11(1):151-71. Wolfe F, Smythe HA, Yunus MB, Bennett RM, Bombardier C, Goldenberg DL, et al. The AmericanCollege of Rheumatology 1990 Criteria for the Classification of Fibromyalgia. Report of the Multicenter Criteria Committee. Arthritis Rheum. 1990 Feb;33(2):160-72. Jacobson TA.Toward "pain-free" statin prescribing: clinical algorithm for diagnosis and management of myalgia. Mayo Clin Proc. 2008 Jun;83(6):687-700. Agmon-Levin N, Zafrir Y, Kivity S, Balofsky A, Amital H, Shoenfeld Y. Chronic fatigue syndrome and fibromyalgia following immunization with the hepatitis B vaccine: another angle of the 'autoimmune (auto-inflammatory) syndrome induced by adjuvants' (ASIA). Immunol Res. 2014 Dec;60(2-3):376-83. Martínez-Lavín M. Fibromyalgia-like illness in 2 girls after human papillomavirus vaccination. J Clin Rheumatol. 2014 Oct;20(7):392-3. Sendur OF, Tastaban E, Turan Y, Ulman C. The relationship between serum trace element levels and clinical parameters in patients with fibromyalgia. Rheumatology International 2008 May 22. Ahmed W, Khan N, Glueck CJ, Pandey S, Wang P, Goldenberg N, Uppal M, Khanal S. Low serum 25 (OH) vitamin D levels (<32 ng/mL) are associated with reversible myositis-myalgia in statin-treated patients. Transl Res. 2009 Jan;153(1):11-6. Clin Rheumatol. 2009 Aug;28(8):971-3. Myalgias or non-specific muscle pain in Arab or Indo-Pakistani patients may indicate vitamin D deficiency. Clin Rheumatol. 2009 Aug;28(8):971-3. Cordero MD, Alcocer-Gómez E, Culic O, Carrión AM, de Miguel M, Díaz-Parrado E, Pérez-Villegas EM, Bullón P, Battino M, Sánchez-Alcazar JA. NLRP3 inflammasome is activated in fibromyalgia: the effect of coenzyme Q10. Antioxid Redox Signal. 2014 Mar 10;20(8):1169-80. Alcocer-Gómez E, Cano-García FJ, Cordero MD. Effect of coenzyme Q10 evaluated by 1990 and 2010 ACR Diagnostic Criteria for Fibromyalgia and SCL-90-R: four case reports and literature review. Nutrition. 2013 Nov-Dec;29(11-12):1422-5. Morris G, Anderson G, Berk M, Maes M.Coenzyme Q10 depletion in medical and neuropsychiatric disorders: potential repercussions and therapeutic implications. Mol Neurobiol. 2013 Dec;48(3):883-903. DiNicolantonio JJ. CoQ10 and L-carnitine for statin myalgia?Expert Rev Cardiovasc Ther. 2012 Oct;10(10):1329-33. Cordero MD, Alcocer-Gómez E, de Miguel M, Culic O, Carrión AM, et al.Can coenzyme q10 improve clinical and molecular parameters in fibromyalgia? Antioxid Redox Signal. 2013 Nov 20;19(15):1855-60. Wallace DJ, Gavin IM, Karpenko O, Barkhordar F, Gillis BS. Rheumatol Int. Cytokine and chemokine profiles in fibromyalgia, rheumatoid arthritis and systemic lupus erythematosus: a potentially useful tool in differential diagnosis. Rheumatol Int. 2014 Nov 7.